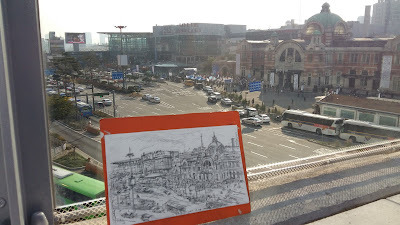 Seoul Station was familiar to me long time ago . 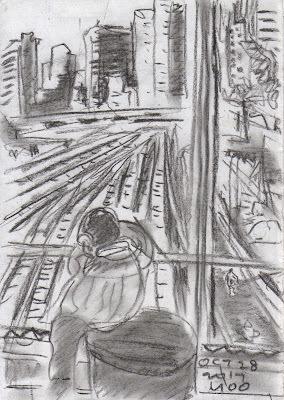 a couple of times a year. 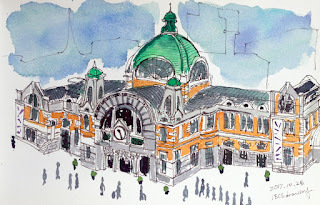 have a chance to go to Seoul Station. enough time. I can only hope for the next time. 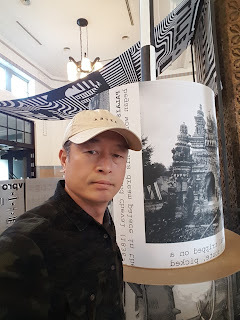 그림을 그리면서 듣는 live 피아노 연주는 무척 인상적이었다. 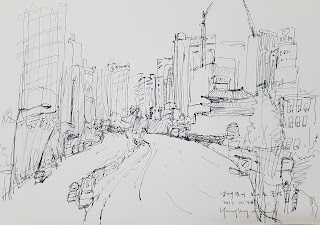 이번 서울로7017은 그릴거리가 많아 좋았습니다. 따뜻한 날씨도 어반스케치하기에 정말 좋았습니다. Seoul Station is one of the most favorite sketching subjects for me. 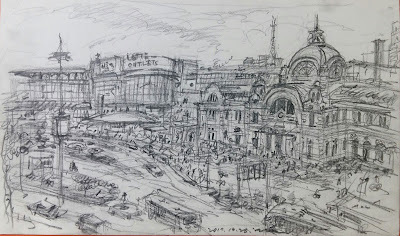 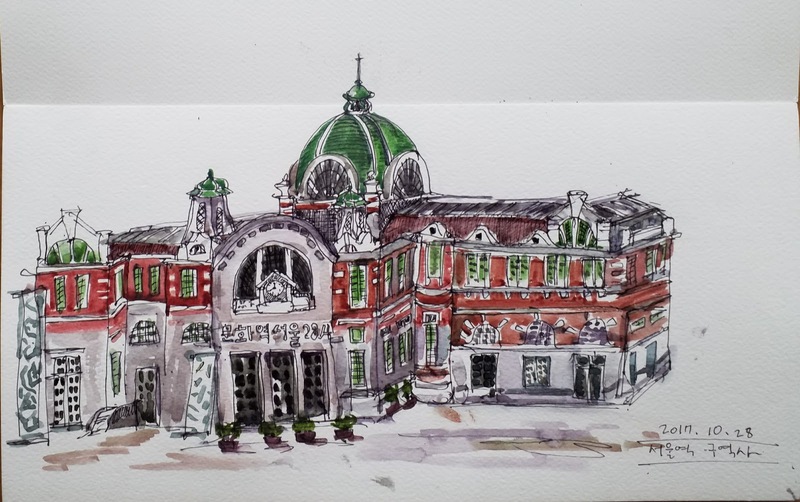 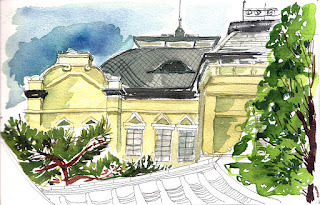 I often sketched the famous historic station several times including the 30th Worldwide Sketchcrawl on April, 2011. 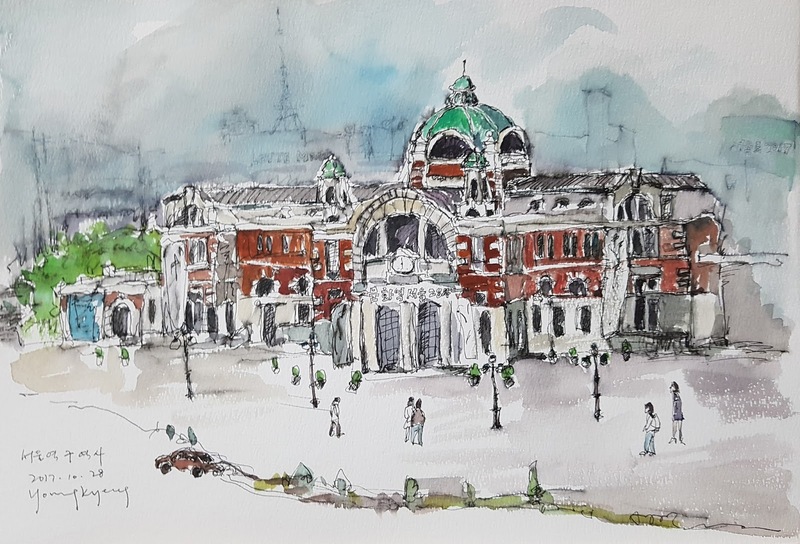 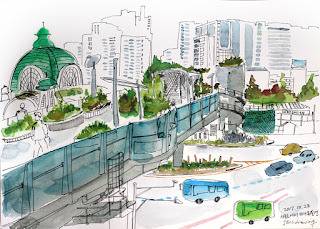 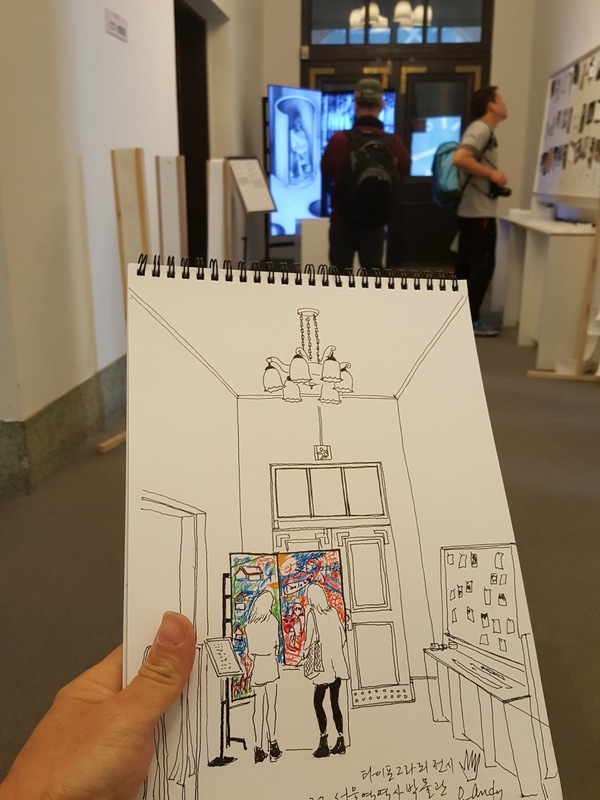 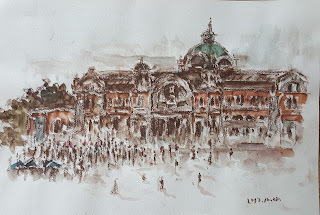 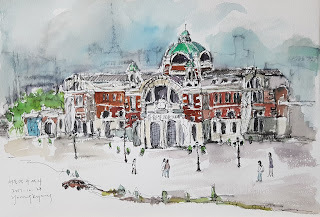 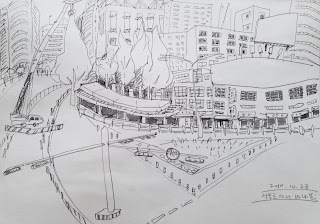 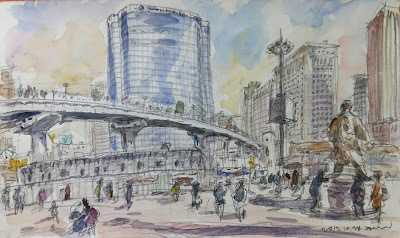 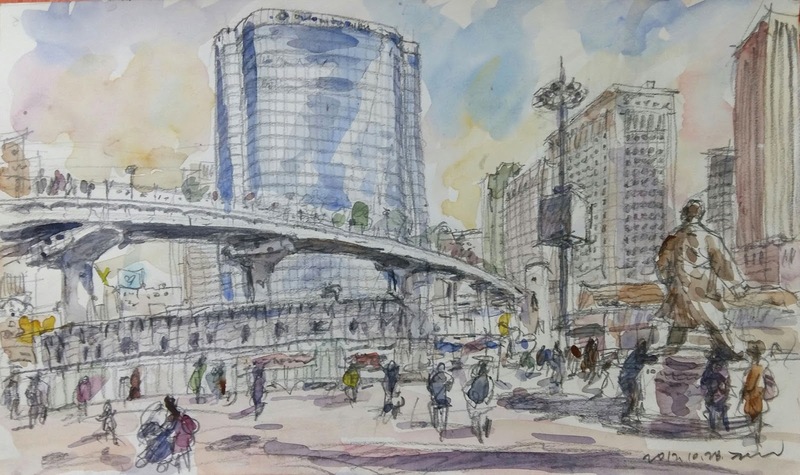 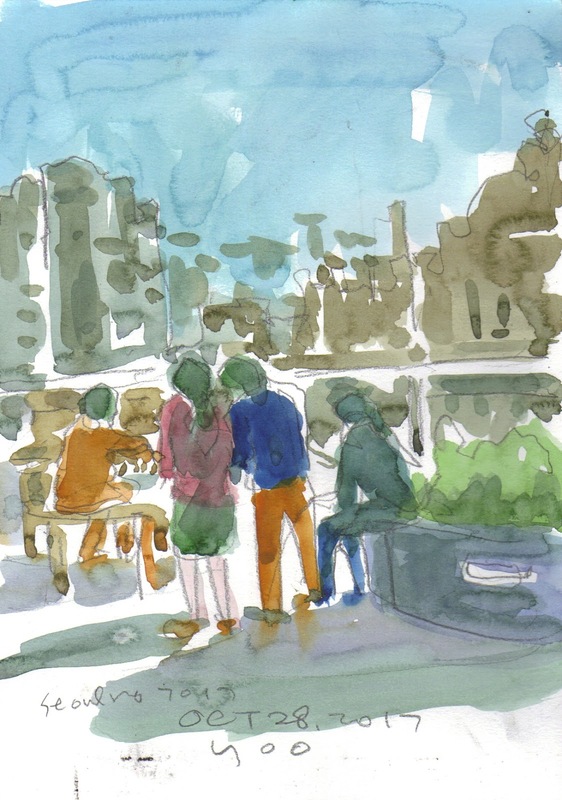 It was very fine last Saturday, we Seoul urban sketchers met at Food Court on the 3rd floor inside Seoul Station building for sketching around the station building and Seoullo 7017, new attraction for citizens and tourists. 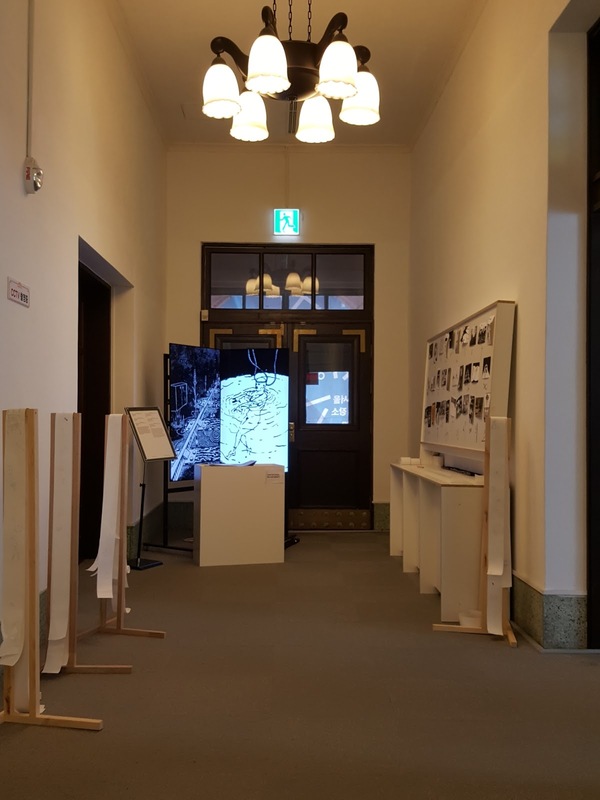 The Seoullo 7017 project is completed five months ago, that promotes the regeneration of Seoul Station area by remodelling the old Seoul Station overpass construction into pedestrian walkaways. There are a variety of facilities along Seoullo 7017, including an information center, cafes, gardens, and stages. Seoullo 7017 itself is open all day, every day for many visitors to enjoy at their leisure. At first, I began sketching here and there in and out of the station building from a new perspective, looking for the new scenes I didn't draw before. 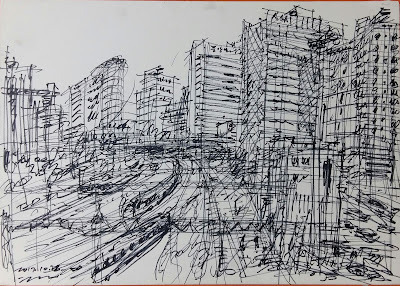 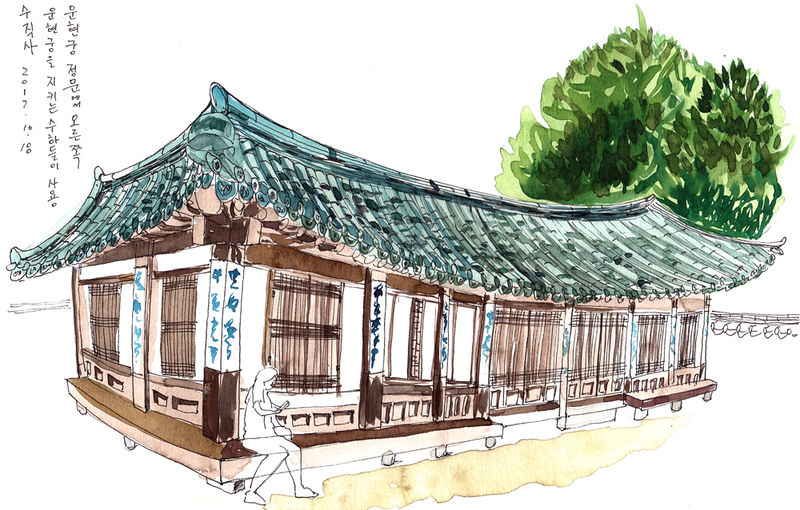 After lunch, I walked up to the Seoullo 7017 walkaways and enjoyed sketching the attractive panoramic scenes of downtown Seoul. 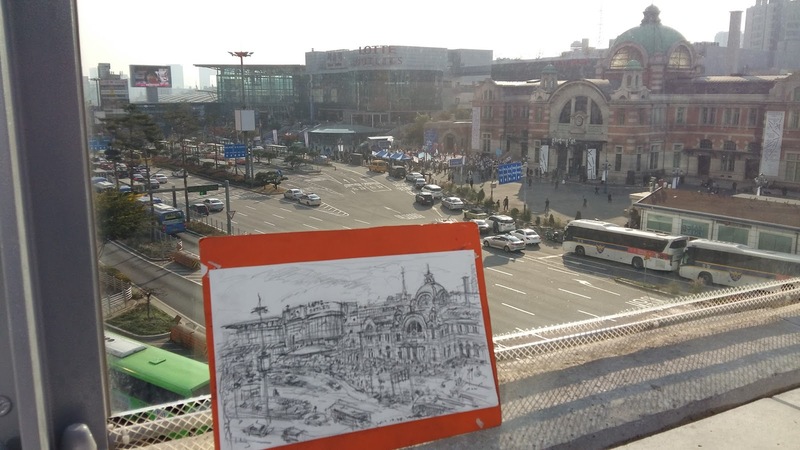 Many pedestrians and children came up to me and were very interested in sketching on the spot quickly in the crowd. 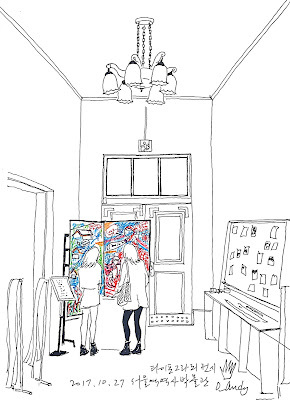 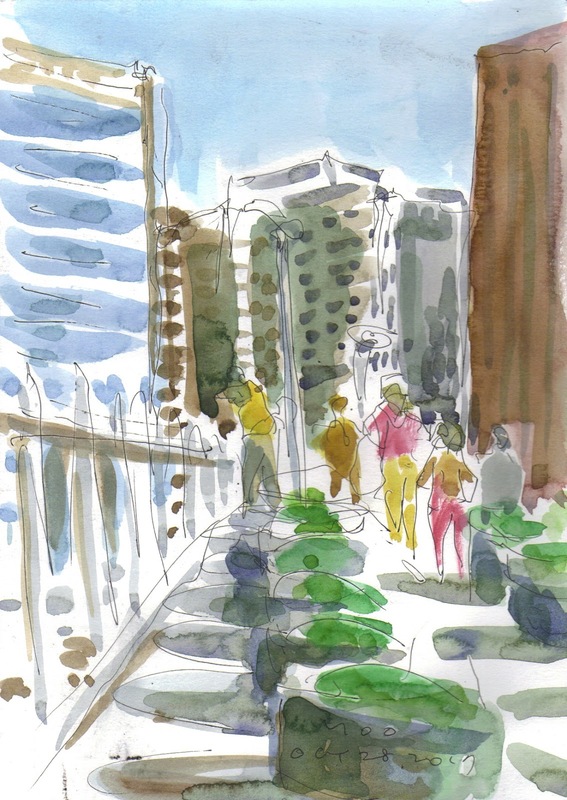 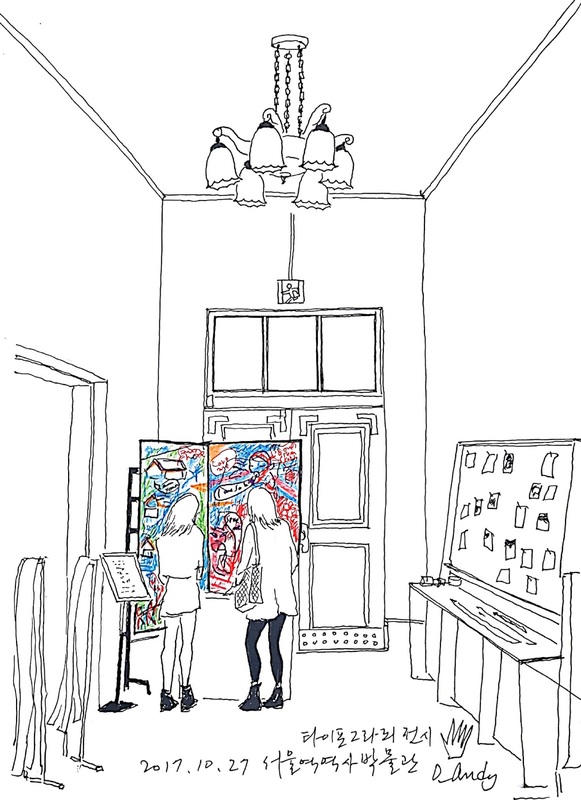 I was attracted by the colorful buildingscapes and enjoyed the lively sketch time as if I were floating in the air. 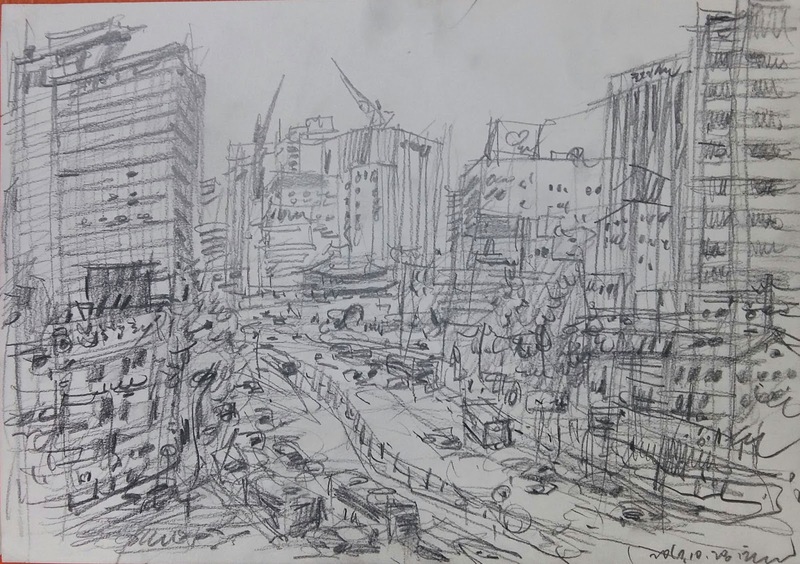 서울역과 그 주변은 명실상부한 어반 스케치의 중심부라 하겠습니다. 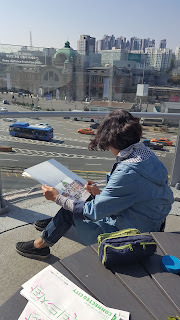 어반 스케쳐들의 꾸준한 작업을 위해 마련된 공간이라고 생각합니다. 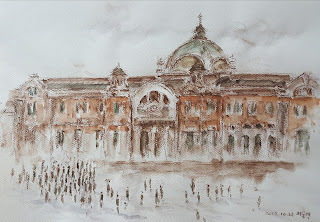 Old Seoul Station building! 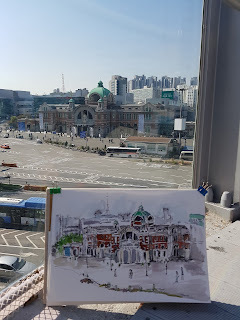 I went to Seoul Station which is a place of memories of many people. 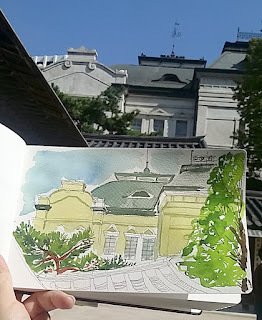 It was the best place to sketch. 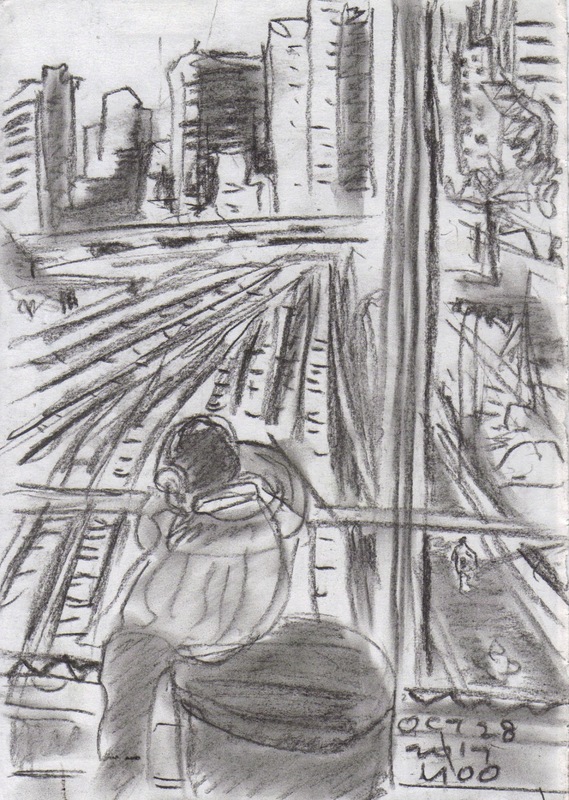 I'll come back next time. 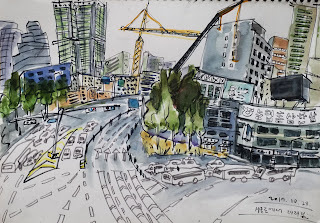 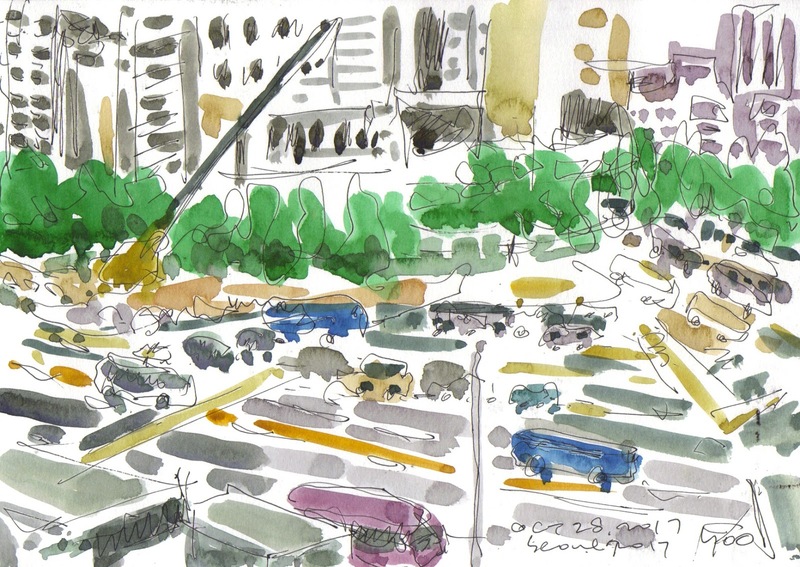 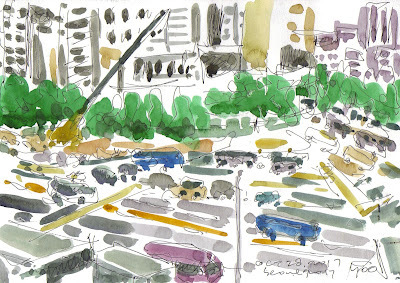 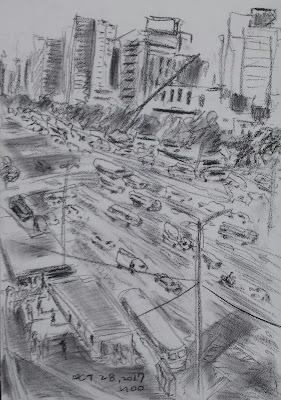 The scenery of Namdaemun 30 × 21 cm. 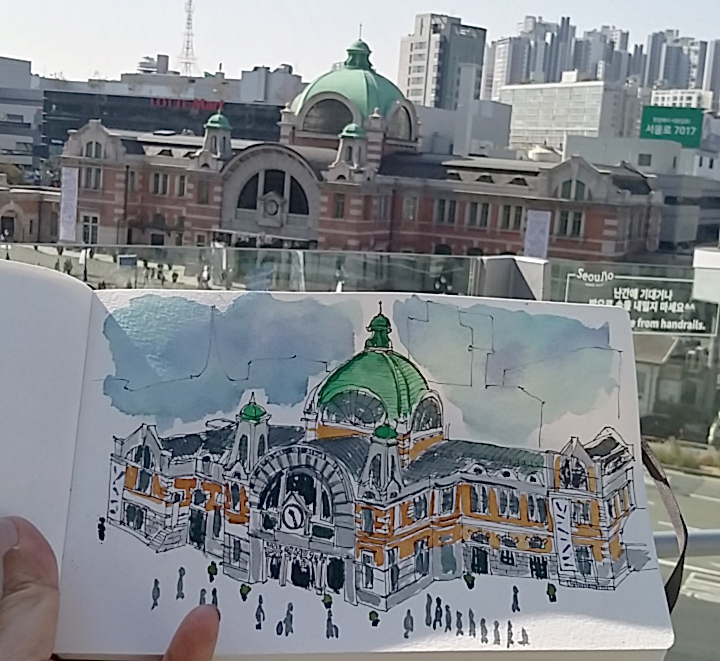 Autumn at Seoul Station was beautiful. 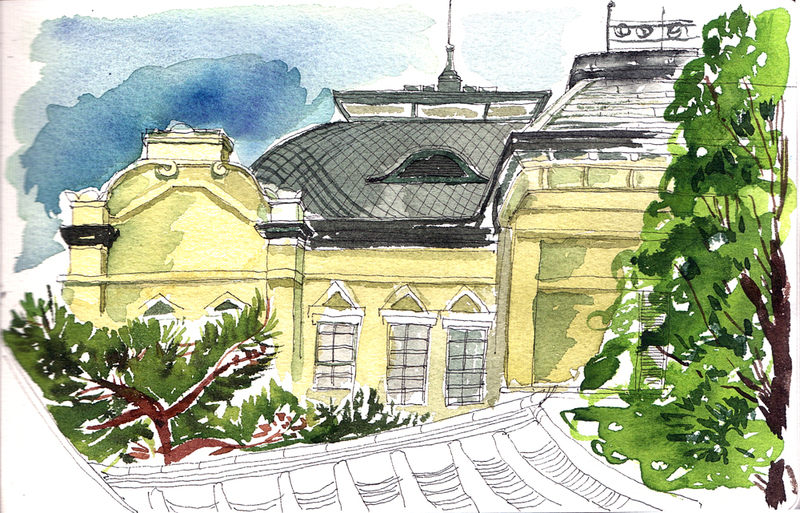 The former station building was renamed as Culture Station Seoul 284 and was used as an exhibition hall. 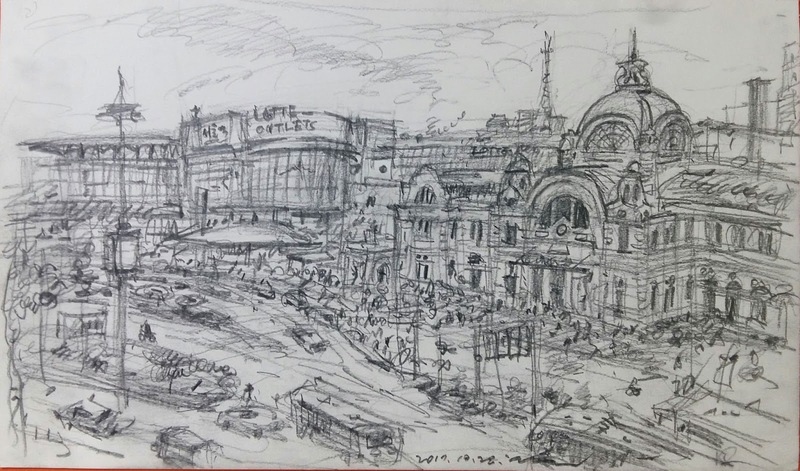 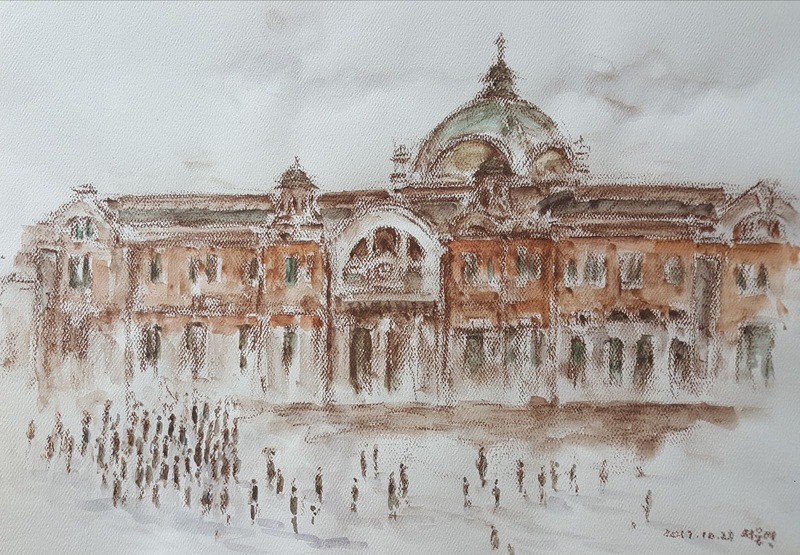 Instead of the new Seoul station, I drew Seoul Station in my memory. 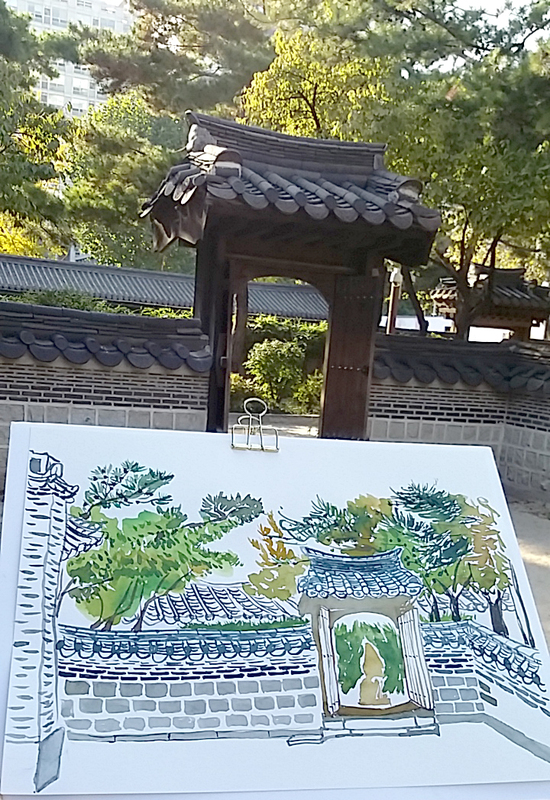 The scenery surrounding Seoul's scenic beauty stirred up the scenery of Seoul. 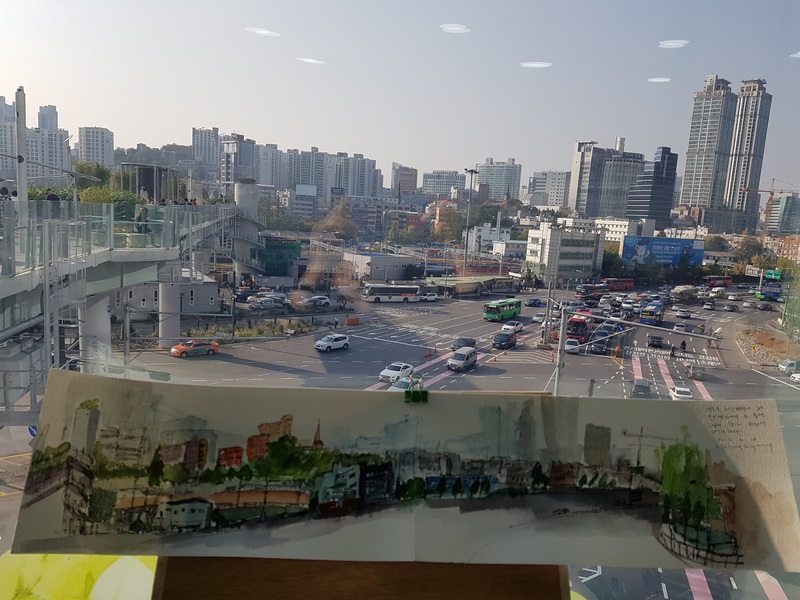 I wanted to paint 360 ° panoramic, but I just sketched out one side. 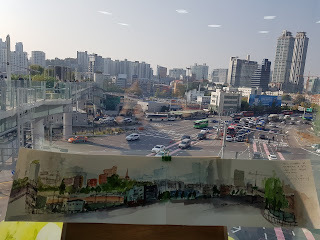 밑에서만 보다가 내려다 본 서울역사 주변은 아름다웠다.보는 곳마다 그림이 되는 풍경에 꼭 다시 오리라 생각해 보았다.고가도로위 산책로에서 스케치 할때는 피아노 음악 때문인지 더 몰입해서 좋았고~~ 끝나고 간단한 커피타임도 즐거웠다. 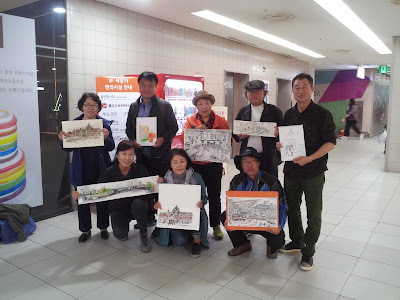 이번 11월11일 스케치 모임은 Urban Sketchers 10주년 기념 행사(Urban Sketchers Global 24hr Sketchwalk)와 제 57차 World Wide SketchCrawl 행사를 겸해서 열리게 되었습니다. 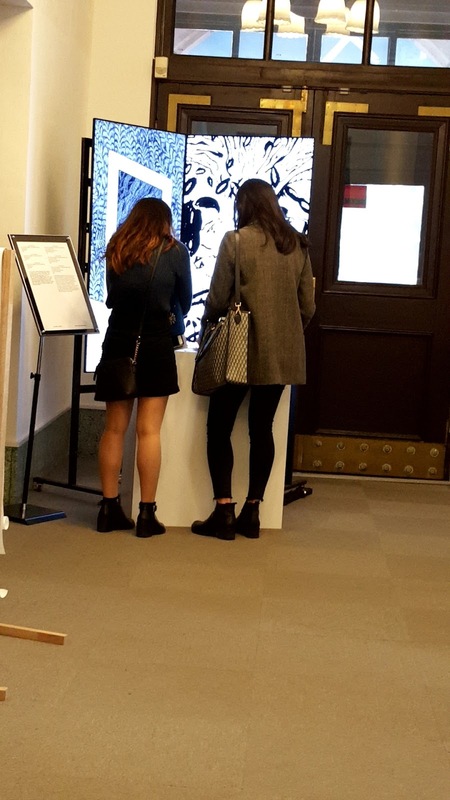 장소는 서울 시민과 외국인이 즐겨 찾는 명동으로 정했으며 아침의 만남을 생략하고 인근의 남대문 시장과 한국은행, 명동 쇼핑 거리들을 자유롭게 그린 후에 명동성당 뒷마당에서 모여서 그림을 감상할 예정입니다. 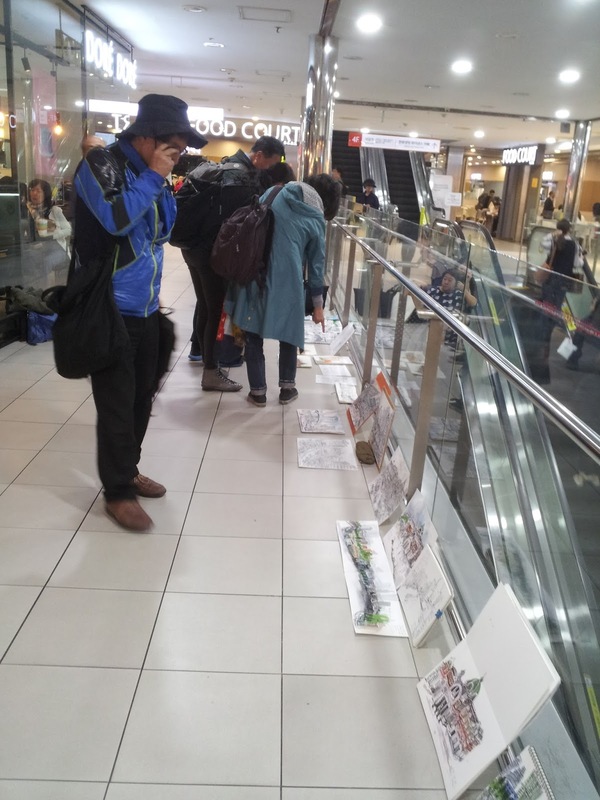 활력 넘치는 장소 명동 주변을 그려보는 좋은 기회가 될 이번 행사에 많은 참여바랍니다. 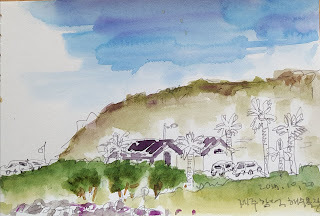 It was a very fine day. 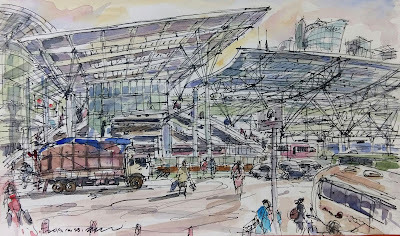 Seoul station is the main station for railroad. 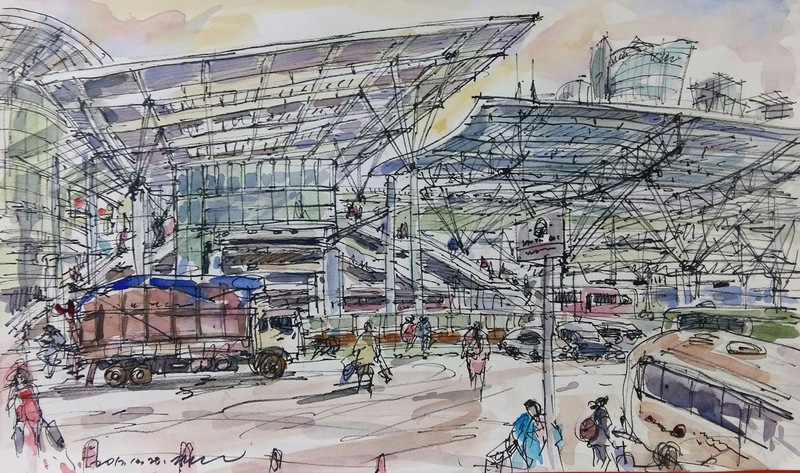 Though we had been sketching at the station we would be never tired of sketching there by moving people and changing surrounding scenery through all the seasons. 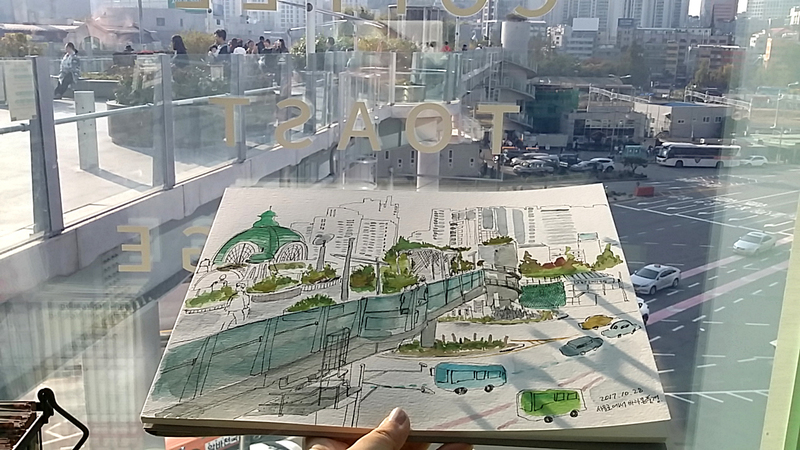 Even more the Seoul Station Overpass built on 1970 was changed into a new tourist attraction this year. We took a course for sketching in the afternoon. 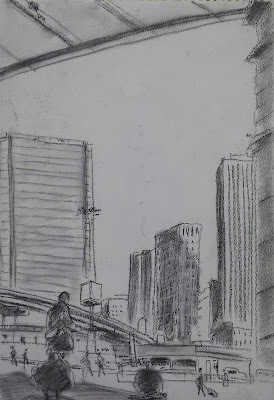 All the bridge was full of citizens and tourists. 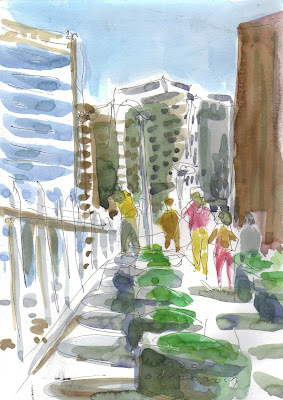 All around urban scenery was satisfactory with Autumn fine weather. Every participant agreed that we should visit here regularly for sketching. Thank you all! 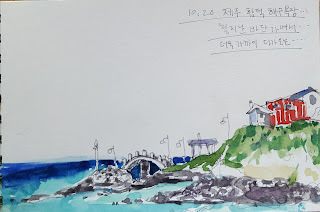 시월의 마지막 토요일은 스케치하기에 정말 좋은 날씨였어요. 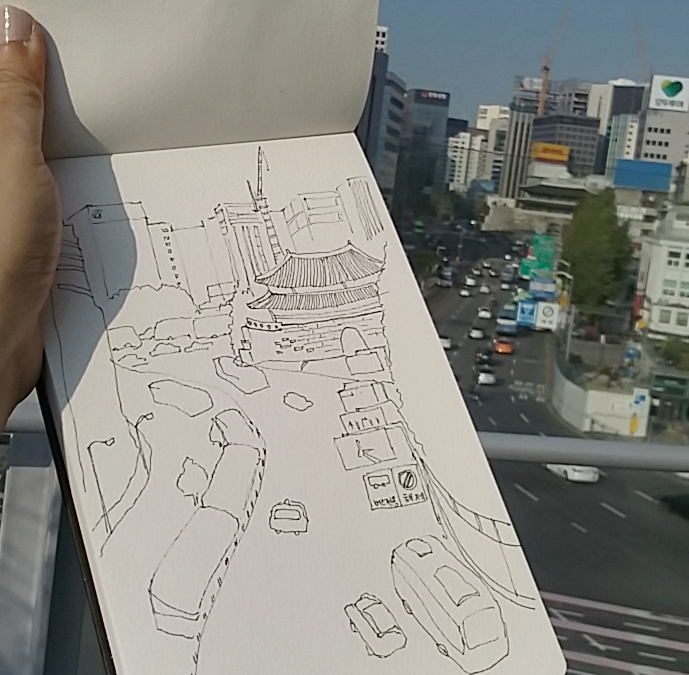 서울역에서 오전 스케치를 마치고 그동안 미뤄두었던 서울로 7017로 향했습니다. 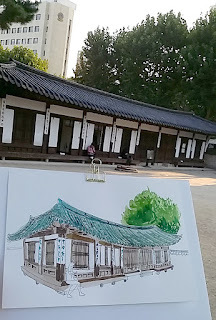 올라가기 전에 올려다 보면서 한장 그렸구요. 그런데 아쉬웠던 것은 구역사 옆 카페앞 계단에서 그리려는데 보안요원이 몇번이나 와서 계단에 물을 뿌리며 여기 앉지 말라고 하시더군요. 노숙자가 앉게 된다구요. 문화재 구역이라구요. 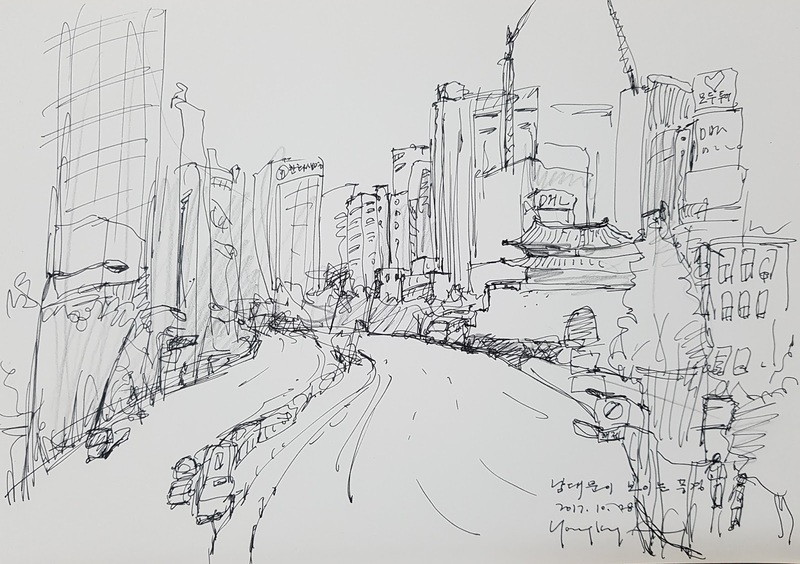 그래서 제가 물었어요. 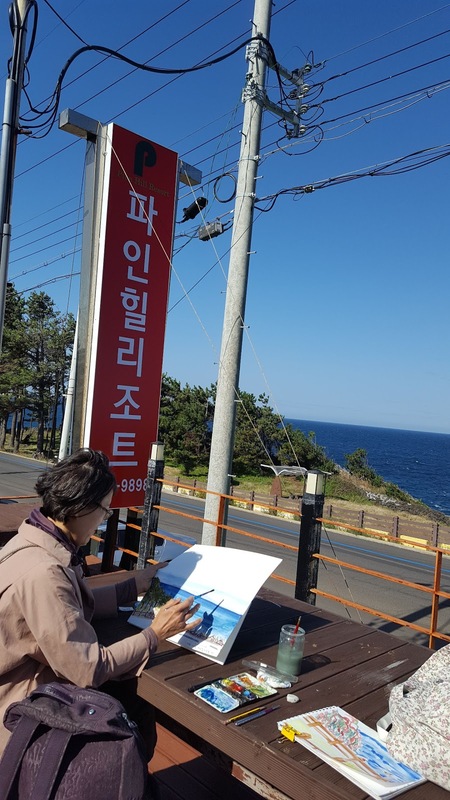 "도대체 문화재 관리구역에서 문화 행위를 못하게 하는 것은 말이 되느냐구요" 그랬더니 "그건 나한테 묻지 말라"고 하더군요. 아직도 우리는 멀었다하는 실망감이 또 왔어요. 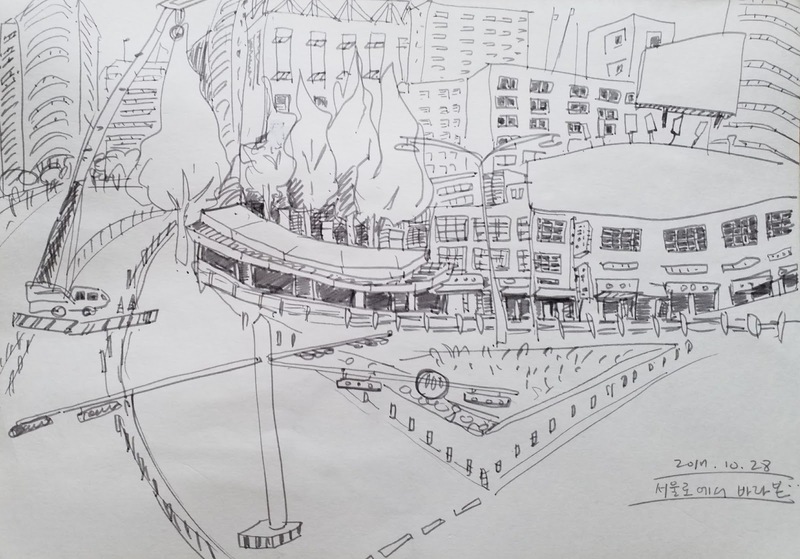 전에 강남 교보빌딩안에서 그리려다 쫓겨나서 앞에서 그리려니 그 또한 교보 구역이라고 밀어낼때도 그랬어요. 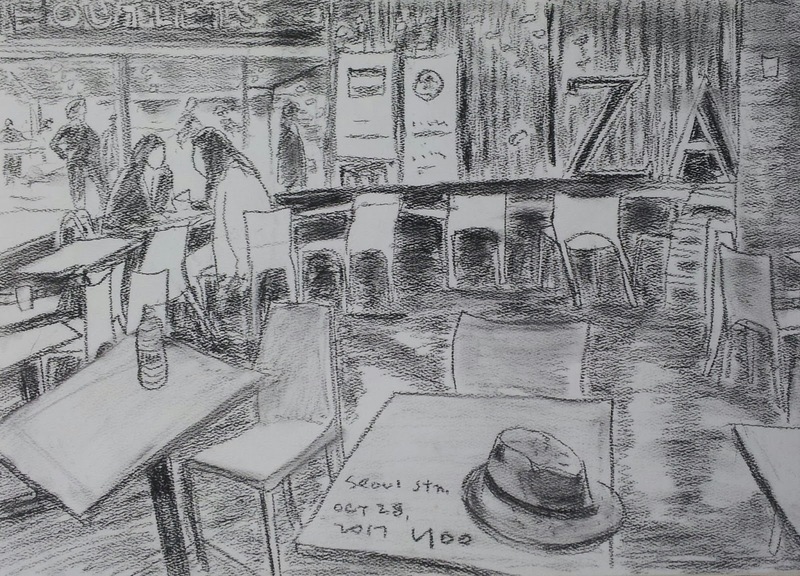 아마도 몇십년 후에는 좀 나아지겠지요. 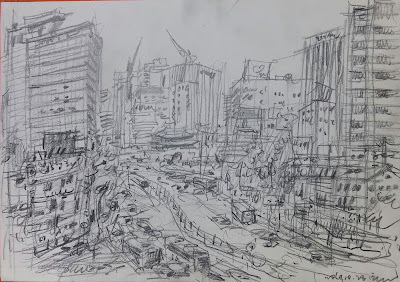 서울로 7017 위에서의 그림 환경은 좋았어요. 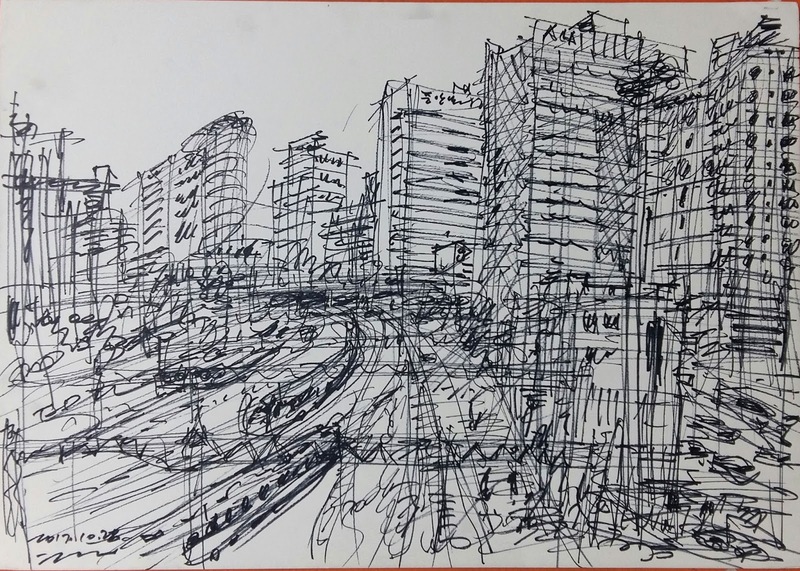 공기도 그닥 나쁘지 않았던 것같았구요. 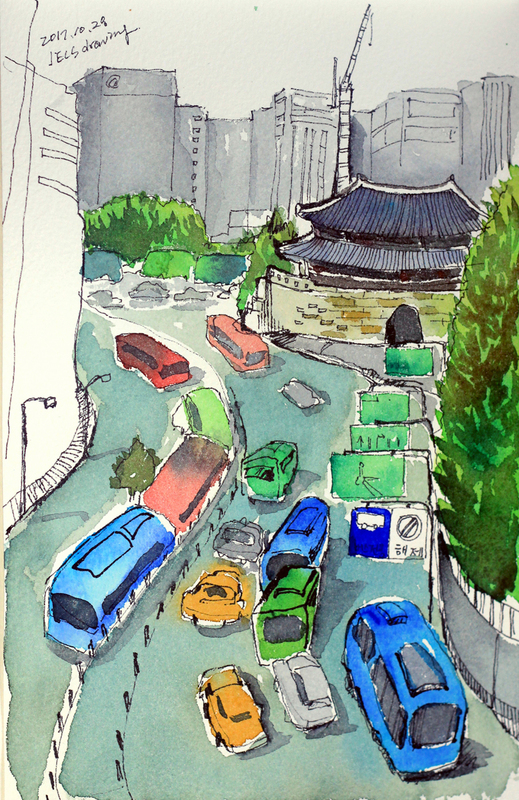 새로 오신 윤선생님 반가왔습니다. 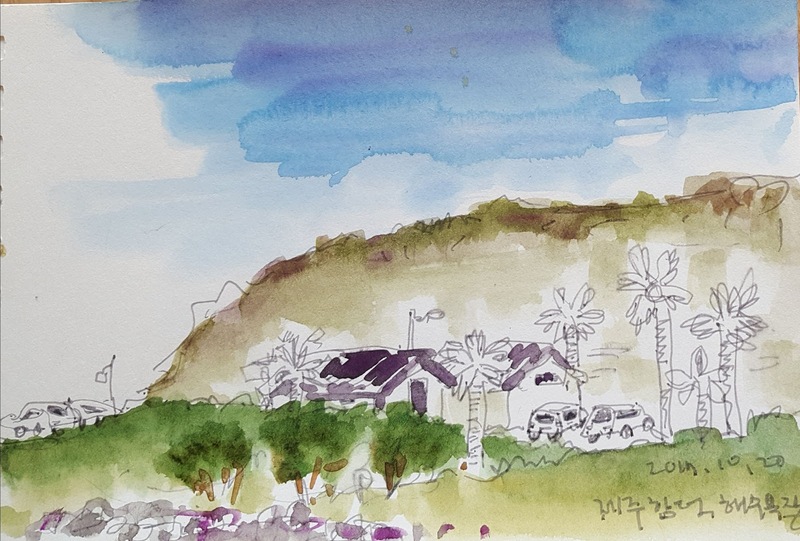 컨디션 매우 안좋으심에도 참여하신 백선생님께도 진정 감사드립니다. 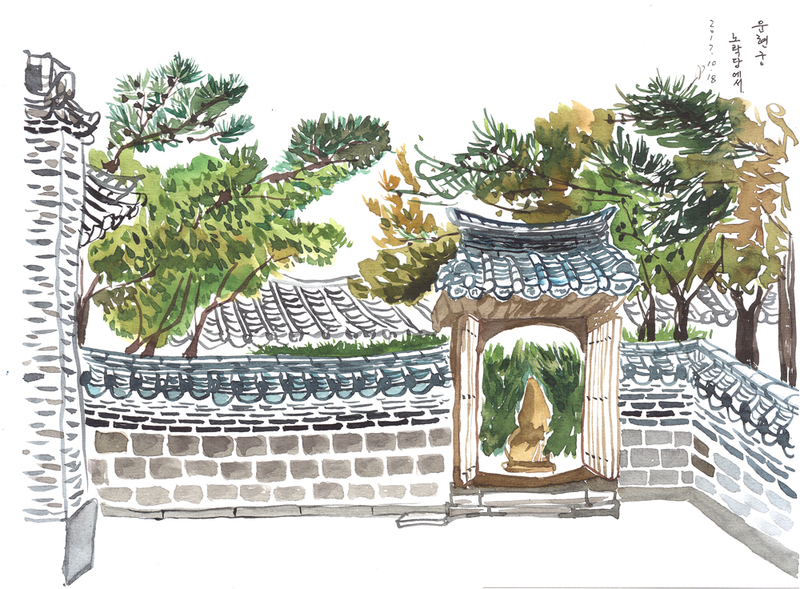 중독되면 어쩔 수가 없는가 봅니다. 감사합니다! 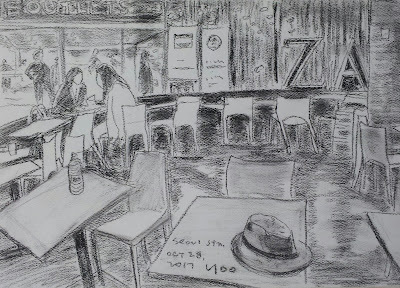 다른 궁처럼 화려하진 않았지만 고즈넉하니 소박한 아름다움이 있는 궁이였습니다. 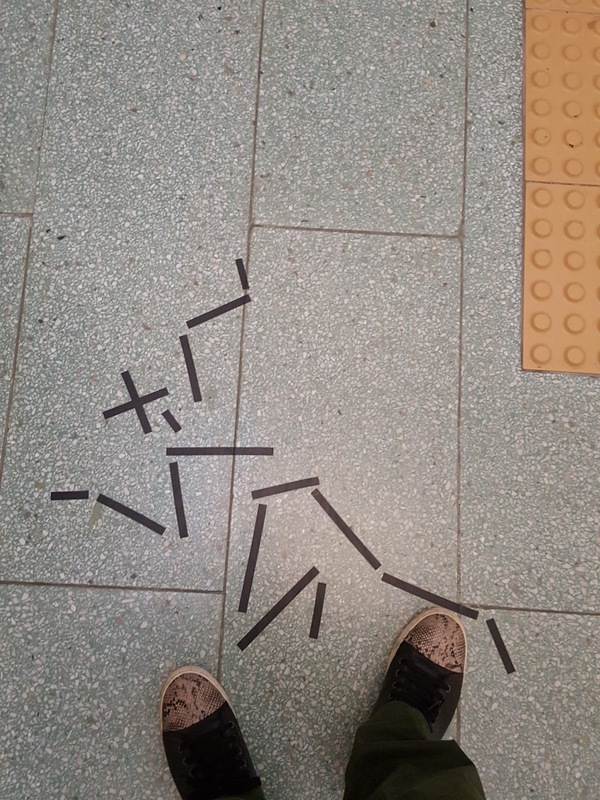 다시 한번 방문하고 싶은 곳이였습니다. 우리나라 다른 궁도 스케치하고 싶네요. 날씨도 좋았고 함께 그리니 더 좋았습니다.